If you want to give flowers for Thanksgiving but feel like being creative instead of sending a pre-arranged bouquet, you can make your own floral gift. Head to the grocery store, farmers market and craft store to gather the supplies you’ll need for these DIY flower arrangements. Making your own flowers to give is fun and it’s a special way to add a personalized touch to a gift. Turn a mini or large pumpkin into a planter. Simply remove the top quarter of a pumpkin and scoop out the seeds and pulp. 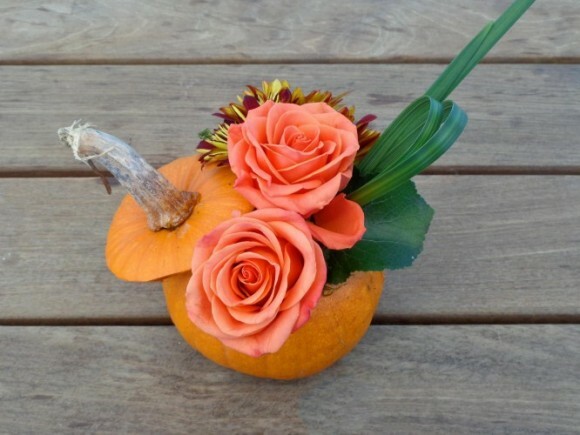 Fill the pumpkin with floral foam and flowers. Consider dahlias, strawflowers, scabiosa, forget-me-nots, zinnias and nigella. While not a flower, corncobs are plants that appropriately reflect the abundance felt during the holiday season. Make maize festive to give this November by coating about 10 dried corncobs in metallic copper and gold spray paint. When dry, secure the cobs around the outside of a large vase with hot glue. Fill the vase with floral foam and add your favorite seasonal flowers. Wheat is a seasonal staple so it makes sense we should celebrate it by giving it as a gift. Gather a small handful of wheat and wrap it with twine. Invert a cloche and place the wheat inside, and then top with the base and turn it upright. Beautiful! Send a vase of gilded fruit. In your large vase, place florists foam strong enough to secure heavy fruits like pomegranates, apples and oranges. Cover your fruit with spray adhesive and metallic glitter; just enough to give the natural look of the fruit a festive twist. Using strong wooden skewers attached to each piece of fruit, place your bounty into the foam at varying heights to create a lovely display. If you want to go with traditional flowers to send for Thanksgiving, think about nodding toward the old. Vintage vases filled with hydrangeas look stunning when mixed with a pinecone here and there and even a pumpkin on a stick. While you might be able to ship these arrangements using a courier who specializes in fragile goods transport, it may be best to create these gifts to give in person.